Corinthians deserve credit for their performance in the State Championship final, but the way in which the referee overturned a penalty awarded to Palmeiras was one of the strangest things I’ve seen in football. Corinthians fans would rather focus on the football, but the bizarre handling of a penalty decision is the biggest story from Sunday’s state championship final between Palmeiras and Corinthians. 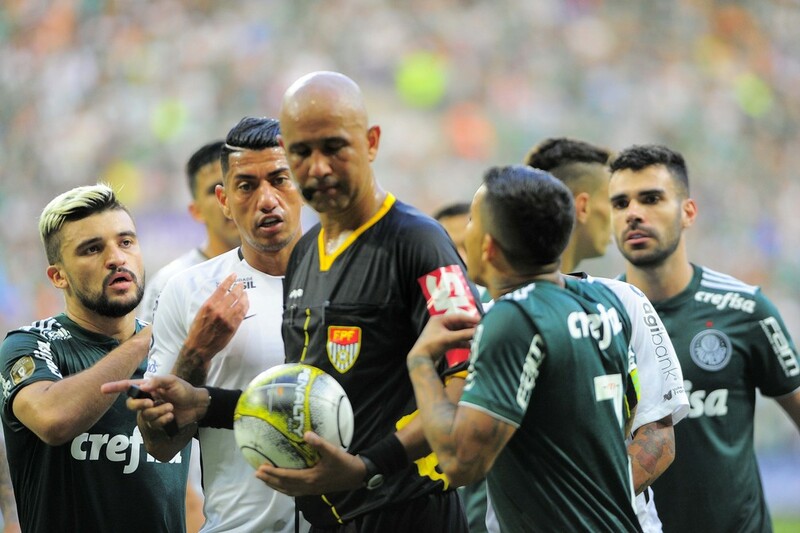 The match was stopped for eight minutes as players argued with the ref and each other while the ref struggled to make up his mind on whether or not he should award a penalty to Palmeiras. The referee initially gave a penalty and then overturned his decision six minutes later. In case you don’t have a full eight minutes to watch a video of the incident below, I’ve summarised it in words. Now, justice was done in the sense that Ralf actually got the ball, so it was ultimately the correct decision not to give a penalty (it was still a close call though because he also got the player). But the way in which this was handled will not only have messed with Palmeiras’ player’s heads psychologically, which could have influenced their performance for the rest of the game and indeed during the penalty shootout. But this incident sends out other, more sinister, messages: that referees decisions can be overturned by aggressive player protests; the rules and procedures were not followed; someone other than the match officials influenced the decision. Palmeiras went on to lose the match, 1 – 0, and lose the tie, on penalties. Had this penalty stood (mid way through the second half), the chances are that Palmeiras would have drawn the match, won the tie and taken the trophy. Understandably, Palmeiras club officials have reacted furiously. They have said that they will field a reserve team in next year’s competition and told their players not to go to this year’s award ceremony (where eight of their players were nominated in the team of the competition). They have even asked supporters of the club that work for the Sao Paulo Football Federation to resign in protest. Since the incident happened on Sunday the fallout has continued all week and Palmeiras have presented evidence to a sporting tribunal saying that external factors influenced the referee’s decision and have asked for the result to be annulled. Now, the official line from the Sao Paulo Football Federation is that the fourth official advised the ref to overturn the decision because he had a better view of the situation than the ref. This is complete nonsense. It was almost impossible for him to have a better view of the incident since it happened in the box and the fourth official was on the halfway line. The fourth official was also on the side of the field behind the players meaning that his view of incident. Of course, using a VAR could have avoided all of this, but the fact was that there was no VAR in this game and the officials were not allowed to use video replays to make their decisions. It seems that this may have happened or that some official other than the match officials told one of the match officials that they should not give a penalty. Amid all of these controversy, it should be pointed out that Corinthians were very good and Palmeiras were quite poor. Considering that Palmeiras have the best players (in my opinion and that of most other pundits), they didn’t create very many clear cut chances. All that Corinthians needed was a goal (scored in the first minute) and their excellent defence shut out Palmeiras for the rest of the game. The result is painful for Palmeiras, who had been the best team throughout the competition, only to fall at the final hurdle against their main rival. After selling Jo, Corinthians have been without a top quality striker so to get to the final and overturn their first leg deficit really is quite impressive. Fair play to them for that. Terrible play from the ref. This entry was posted in Match reports, State Championships and tagged Corinthians, Palmeiras, Referee, VAR by Brian Davidson. Bookmark the permalink. Good comments on the game! I disagree on wich team shoud have won the game though. Palmeiras deserved to win the Championship in my opinion (even though they didn’t played their best and had few clear cut chances to score. But if they would have scored a goal (in the pentaly overturned) and tied the game, it seems that all the comments would be in favor or Palmeiras, as the team that had the ball for the major part of the game and insitently tried to find a way to reach the adversary goal. Defense is the merit of Corinthians, in my humble opinion, just it. As to the referee’s blunder, it is difficult not to say something and let it go unoticed. I don’t think it would be ok to score a goal in a penalty that did not occurred in fact. But the question is. Mistakes are part of the game if we don’t have VAR technology to aid to clear doubts. Referee mistakes are polemic, and there are also people who are contrary to the use of the technology under the allegation that mistakes are part of the beautiful game’s magic. I’m particularly in favor of the use of the VAR (though it is quite expensive here in Brazil for the clubs, and I really don’t know why it is that expensive). Anyway, VAR cannot be used to aid any referee’s decision for now. Let’s try to examine things taking a look back on referee’s mistakes that happened in the course of the years and the benefited or affected parties. In the 2005’s Brazilian Clubs Championship, Tinga (a player of Internacional of Porto Alegre) is tackled by Corinthian’s goalkeeper in one of the most scandalous and clear penalties of that Championship. The referee not only didn’t awarded the penalty to Internacional but also sent Tinga out of the field for simulation, a regrattable and clumsy mistake that have costed Internacional that Championship, won by Corinthians with 3 points ahead of the Reds of Rio Grande do Sul. Not to mention that in the Championship, Corinthians counted with external hand of the TJD (Sport Justice Court) after a decision of said court for the annullation of several games (after a case of corruption) which clearly favored Corinthians (not just for the sake of Lucky, because the decision on which games to annul was also polemic and Corinthians took the trophy. Corinthians ex-president Alberto Dualib has a saying on that case, stating that should such annulment have not occurred and Corinthians would not be the Champions. He also asserts that Corinthians triumph that year was a fix. Jô scored a goal with his hands in the last year championship and the assistant referee was right in front of the scene with all privileged view that one could have to give it in to the main referee. But he didn’t. Things like that happen all the time, so it is really difficult not to be a little bit shaked by all this (Conspiracy Theory?). Finally, and not least importantly, I can mention the first game of this year involving Corinthians x Palmeiras, when the referee also overturned its initial decision and awarded a Penalty to Corinthians after seeing a bruise on the leg of a Corinthians’ player after disputing the ball with Palmeiras’ goalkeeper Jailson inside the box. Justice was made in delay, even if the referee hadn’t seen a penalty but just a dispute for the ball at first. Lack of conviction? Well there was time to correct his mistake. Once again in favor of Corinthians this time. I can’t stand saying that rules are for the enemies it seems (for Corinthians everything)!